Do you find it hard to relax at the end of a long day? Are you one of those people that tosses and turns all night long, worrying and stressing over situations in your life? If so, then you know that this can lead to poor sleep patterns. You wake up tired and grouchy and reach for a sugar-filled caffeine “pick me up”, not the healthiest way to start the day. 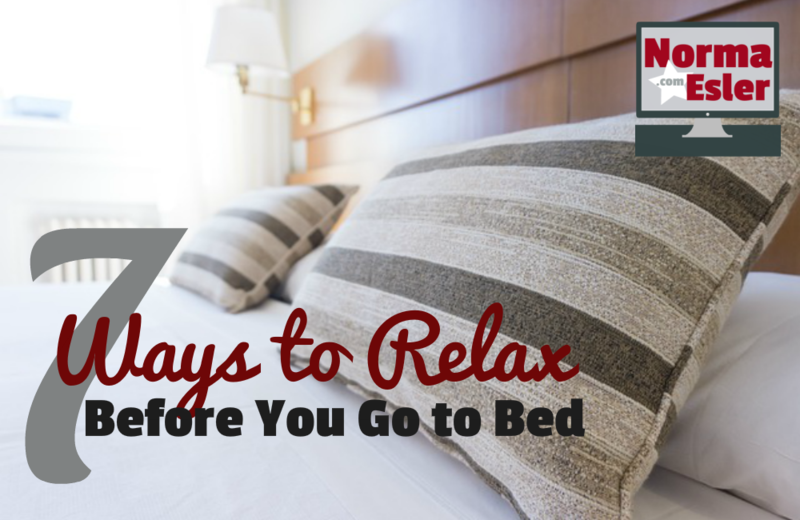 The following 7 tips will help you relax before you go to bed, so you naturally sleep restfully and start each and every day at your fullest potential. Develop a set pre-sleep schedule of activities. Let your brain know it is time to shut down. 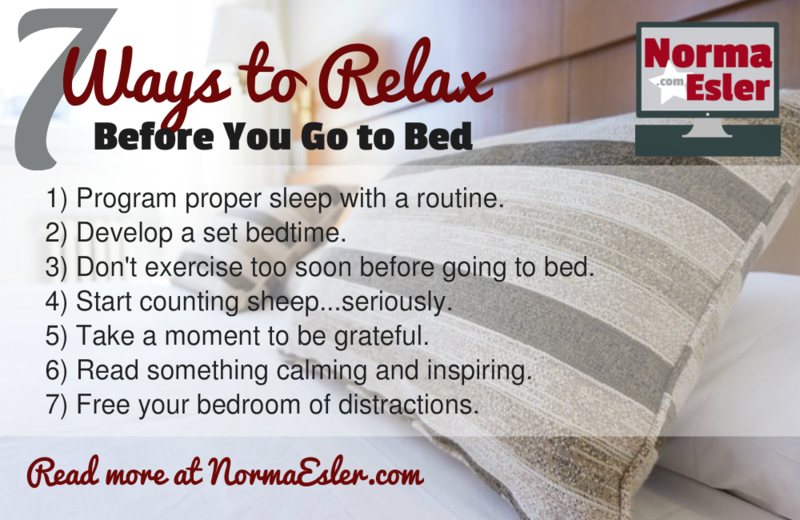 This means limiting stressful thoughts and outward influences before bedtime. This is how you “wind down” before you hit the hay. You could do this by consistently reading for 1 hour before bedtime. Your brain will eventually recognize that 60 minutes of reading in the evening is a signal that sleep is approaching. Most people live a very regular existence. They go to work at the same time, eat lunch and dinner about the same time, and have several consistent daily routines. When you go to bed and awaken at the same time consistently, you program your internal clock to shut down your busy brain and wake up on a given schedule. This relaxes you by putting your sleep pattern on autopilot, instead of you anxiously trying to force yourself to sleep. Exercise and other forms of physical exertion immediately deliver a boost of energy. Soon after, your body tells you that you need rest and recuperation. Exercising in the evening, at least 2 to 3 hours before you go to bed, signals your brain for rest and recovery, rather than a stressful “how will I go to sleep” mentality. There is a good reason the sheep counting strategy works to help you go to sleep. What you are actually doing is replacing stressful and worrisome thoughts with a simple and boring, repetitive mental exercise. You can accomplish the same by thinking of objects or foods whose names start with each letter of the alphabet. Your brain only focuses on one thing at a time, in this instance asimple mental exercise instead of stress and anxiety. Right before you crawl into bed, think about all the reasons you have to be grateful. It is hard to be anxious and stressed out when you realize you have so many things to be thankful for. Doing this right before bed implants positive thoughts on your nighttime brain. Remember when your mom used to read you bedtime stories? Well, they still do the trick. Reading before bed can help you fall asleep quickly, so that you can enjoy a healthy night’s rest. Ideally, the place where you sleep should have minimal possessions. This is especially true regarding consumer electronics, cell phones, MP3 players and the like. The fewer pieces of furniture in your bedroom the better. As you are preparing for bed, your mind unconsciously takes in all of the distractions and objects in your environment. This can negatively affect your ability to fall asleep, creating more stress in the process. Sign up for a daily inspirational email from me at MyInspiredYear.com.